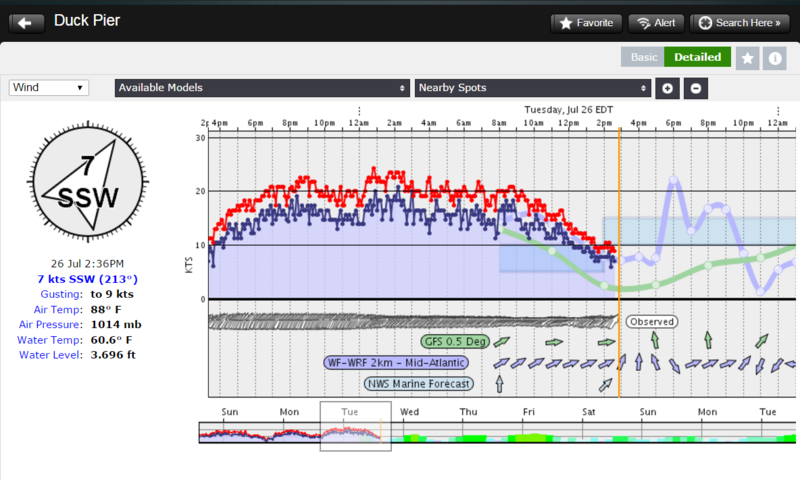 We are seeing a couple of cold pools along the northern OBX NC coast right now known as a “Cold Water Upwelling” event. This is a normal occurrence that shows in small spatial scales along the middle and northern Outer Banks of NC when we see surges or prolonged periods of offshore wind flow. Since the Gulf Stream peels up to the NE away from the coast, we don’t see much of that surface warmth make it into the coastline unless there are calm winds (for permitted surface radiational heating), warm eddies off the Gulf Stream and/or SE onshore flow nudging some of that Gulf Stream warmth westwards. The Gulf Stream is a wind driven surface body of water called a thermohaline circulation. It is a conveyor belt of year round warm surface water. Here is a good example of the current state of the Gulf Stream – you can see the warm river of water right off the NC coast. Compliments of NASA Sport SST. 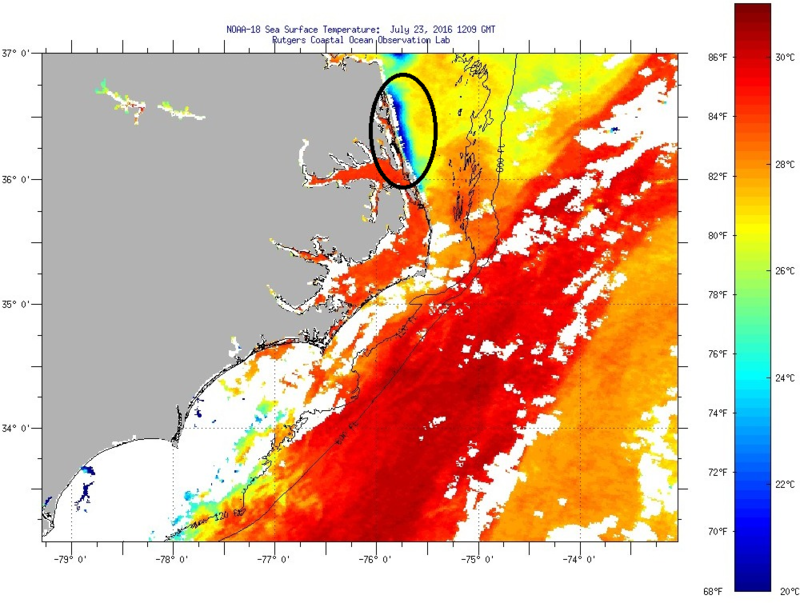 Here is the animated loop from July 6 to present, where we see a bit if warm water eddying in around middle OBX…and the cool water pools developing east of Duck, NC and to the north. We can assume that the warm period present near Duck was due to light winds and high daily air temps heating the waters. 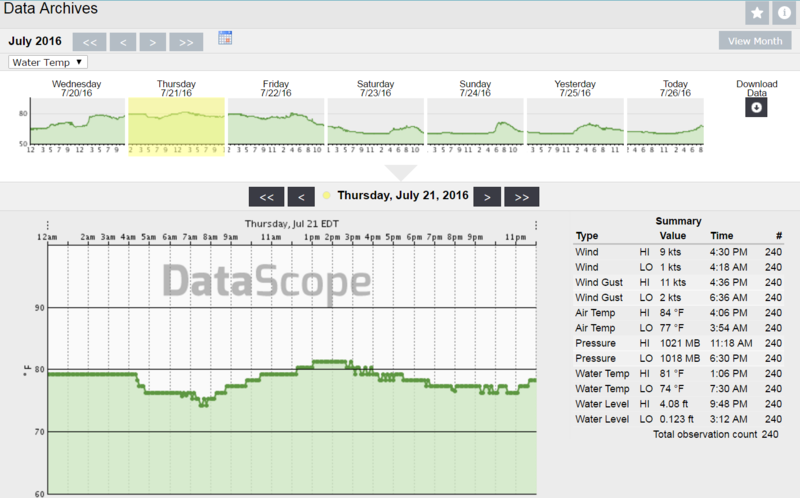 Earth.nullschool.net shows the ocean currents + SST with all the small gyres on July 23rd, 8pm EST. 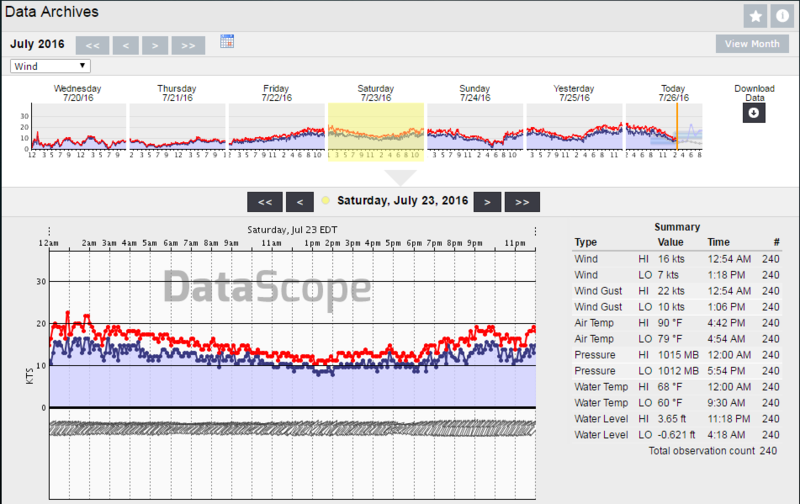 …and to the south along Oregon Inlet, NC at a balmy 84.6° F.
Here is the current Sea Surface Temp at Duck Pier – it was at 60.1° F today, July 26, 2016 at 10:36AM (and is now 67.1° F as of 9:18pm). Check out the pulsing UPs and DOWNs the last several days. So why the huge swing downward and the continuing upwards surges on a daily basis? The man driving mechanism here is wind – specifically offshore wind. Bermuda High pressures build into the east coast during the summer and create a clockwise wind pattern with S/SSE’rlies to Georgia, S/SSW’rlies to SC and swinging more SW’rly up into North Carolina. When we have warm water at the surface and a deep colder body below near the NC coast, the offshore SW/WSW directions of wind will push the warmer water out to sea and the cool water below simply churns to the top (also applies to other offshore directions that may show such as W/NW and NNW from other patterns). This process is known as “Eckman Transport”, where surface currents flow at a 45° angle to wind direction based on stress and drag (Coriolis forcing). You can see here how the shoreline plays a big part in this. Add a 3-5 ft tidal swing and you have the recipe for turnover of fluid layers. 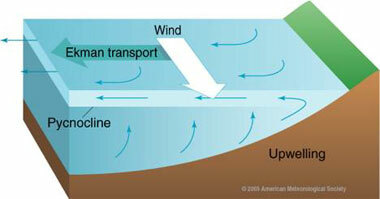 Here is a great side profile of cold water upwelling from NOAA. Likely great fishing waters! The shelf waters of NC out to the continental shelf are rather deep, so there is an abundance of cool water at the lower depths. Since upwelling in this area is the product of wind driven surface stresses and drag, we can see the evidence here with offshore SW/WSW winds remaining rather light to modest during the day to allow for the water surface to warm again…and then cooling as winds crank up at night during low level jetting (we call this “nocturnal jetting”). So let’s take a look at the wind pattern for the last few days and you will see the WSW/SW’rly nocturnal values being the main driving force. 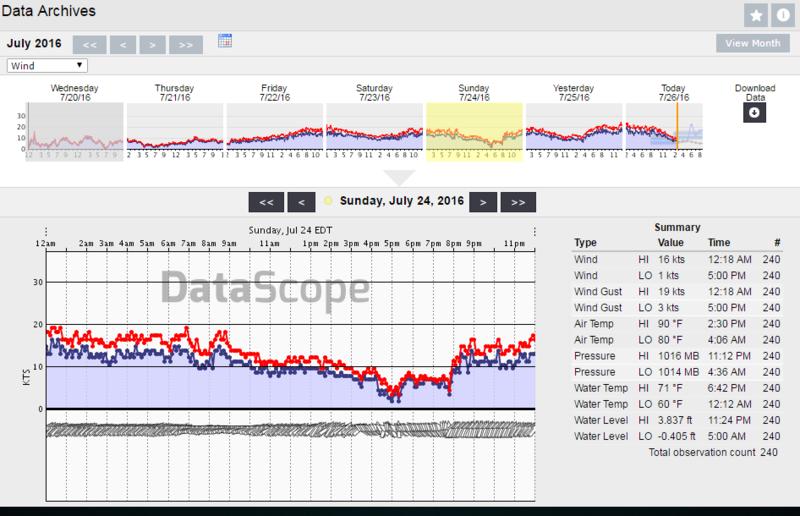 7/23/16: Peak wind avg SW 16kts (gust 22kts) at 12:54AM. 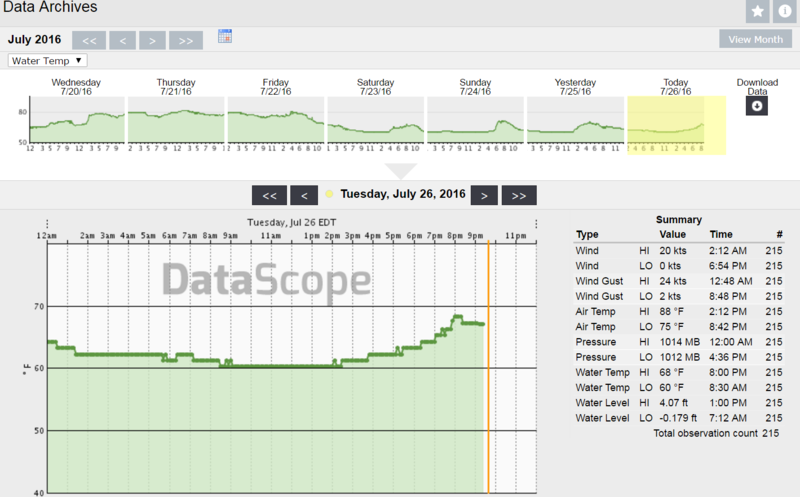 Notice how light the winds were 7/20-/16 – 7/22/16 until the nocturnal jetting started up. That would be the reason waters got so warm. 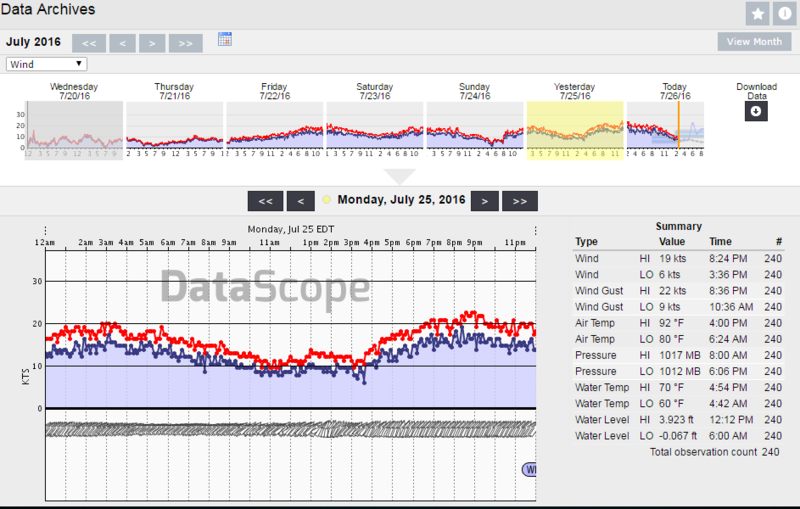 Once the offshore winds started up, the cold water upwelling began like clockwork. Let’s take a quick peek at the Sea Surface Current forecast for that area and you will see the steady offshore flow. Likely not quite as strong as what has been occurring the last few days, but you get the idea. Mainly offshore in accordance to the winds in that area. So hopefully that helps give a better understanding of why this happens and what the setup is. We now know that SW/WSW directions that build over time either day or night…or both… are likely to cause this type of event. From this evidence, we now understand that the night-time winds were the most responsible for the cooling process. With that said, if winds become more onshore or become lighter, it is safe to assume that the water temps will come up again – of course that does not include big rain events or Nor’easters! Those tend to cool waters as well. 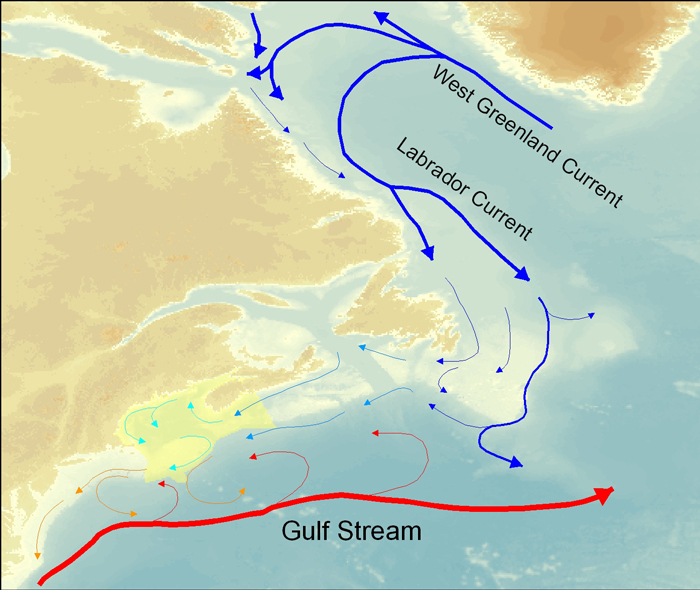 Questions have been asked about the “Labrador Current” being the reason so here is my answer: The Labrador Current (a conveyor belt of cold water transport) generally resides further north along the NE United States, Newfoundland and further north up around Labrador, Baffin Island and Greenland. This deeper, colder, nutrient rich water can sometimes be fed southwards during distant pulses making it as far as northern OBX. In this case, I do not think of it as much of a factor as the winds and Eckman Transport process during nearshore upwelling that is drawing up the naturally occurring colder subsurface water. On the other hand, it could have some deeper connection with the Chesapeake Bay Plume for those cooler subsurface waters. Here is an illustration by GoMA – Gulf of Maine Area Census of Marine Life. Until next time, take care and stay safe!